The best way to get to know a community is by scheduling a tour. 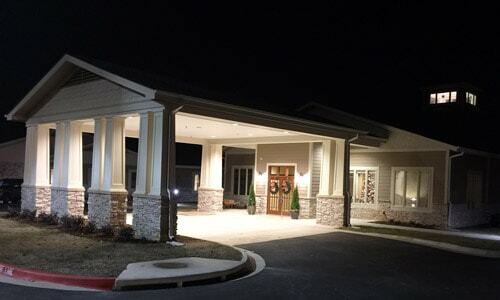 See the facilities, meet the staff and residents, and get a feel first hand what it's like to live at Memory Care of Little Rock at Good Shepherd Memory Care. At Memory Care of Little Rock at Good Shepherd, we believe it is important to keep residents very active. We incorporate a physical and occupational therapy based exercises and principles throughout our Activities strategy. Making a bed, making a snack, or setting the dining room table are important daily activities that promote functional independence. To this end, our activities coordinators work closely with our physical and occupational therapy partners to design individualized activity plans. Our program provides activities in an environment that meets the social, physical, emotional, spiritual, and cognitive stimulation needs of our residents. Caregiving: At Memory Care of Little Rock at Good Shepherd, we are specialists in Caregiving for residents with memory loss. Our caregivers and staff receive some of the most stringent training in the industry to ensure we provide the best care and meet the unique needs of residents struggling with dementia. Care Coordination: From managing chronic illnesses and multiple medications to juggling different healthcare professionals and varying care plans, the health needs of our residents can be quite unique. We utilize the latest technology so that every team member is always up to date on each resident, and in anticipation of the next step in each resident’s care plan. Communication: Communication is key in every element of the Memory Care of Little Rock at Good Shepherd way – whether communicating with residents, family, or health professionals, our staff will ensure open, effective communication. Any family member can be alerted to their loved one's daily activities, by email, text and/or personal telephone call. Our communications program is as customizable as our memory care program. Community Engagement: For residents with memory loss and their loved ones, navigating through the disease process can be isolating and scary. We are committed to being a local resource for education, engagement, and community building. Thank you for your interest in Memory Care of Little Rock at Good Shepherd. Please give us a call to schedule a free tour.